Ren knows it...he's in love, but as he says "I cannot afford to admit it." Ren's now got the emotions of a starcrossed lover. He just needs to learn how to act it. And time is running short. The president of Ren's talent agency has called a test of Ren's acting. If he fails, he'll be fired from the movie (interestingly, it's his agency that will insist on his removal, not the director). The volume starts out with a hilarious encounter between Ren and Bo. Ren is actually confessing his infatuation with Kyoko to the chicken. He's so worried, because she's too young for him but he can't help himself. Ren obviously has no idea that Kyoko is the chicken. Kyoko is so happy for Ren - she's completely clueless that Ren is referring to her. She encourages his interest in the unknown girl because she thinks it will help his acting and she wants him to be happy. Back to the uncostumed Kyoko...Still in her "I'll do anything to help Ren mode," which, let's face it occupies almost all her non-Sho thoughts, Kyoko brings lunch for Ren. She's worried that his poor eating habits are affecting his acting. Ren calls in another favor: "There's one more thing I'd like to have with that lunch box to perk me up...your body and your time...tonight." Kyoko practically melts into the ground in embarrassment. Hot times (well, chastely hot times) ensue when Kyoko comes over to Ren's apartment that night to help him prepare for his test. Kyoko acts the role of Misao (the girl that Ren's character is in love with). Kyoko is thoroughly invested in her part and improvises Misao's personality wonderfully. Ren, on the other hand, isn't acting. He's playing himself and doesn't snap out of it until he's on the verge of kissing Kyoko. By far the most passionate scene of this series so far. Wow! And Kyoko is yet again clueless. She just thinks Ren really gets into his characters. That girl...will she ever learn? 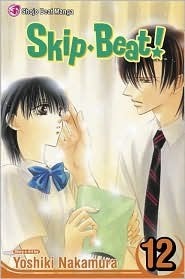 This Manga series I like too,I have a long way to catch up. I found 2 great manga books this week that I liked!! Super excited!! Why are manga books so expensive compared to other books? Do you buy, library or Kindle? Love the Manga Mondays!!! Thanks for letting me take part:) Love the review. Thanks for reviewing this manga series! This volume sounds like it has some very funny moments and some juicy scenes between Ren and Kyoko. Ren talking to the chicken made me giggle because I tend to talk things out with my puppies--they're excellent listeners & never judgmental. Oh Kyoko... I have such a love/hate relationship with how oblivious she is to everything Ren. Poor Ren is in for a very long haul in trying to get Kyoko to realize he has feelings for her. It's always fun to see a more light-hearted volume though! Kyoko really is clueless. Ren will definitely have a hard trying to get his feelings across in the future. When will these two knuckleheads get themselves sorted out? I do love the chicken scene. That just sounds awesome!